From freshwater and deep water shellfish to saltwater fish, seafood is a beloved delicacy in many cuisines. It is rich in nutrients and a great source of vitamins, minerals and protein, and is also rich in omega-3 fatty acids. Consuming fish regularly is beneficial for your health as it can help reduce the risk of several diseases, particularly those that are heart related. To get all the benefits, at least two servings a week are recommended for adults. Let’s dive into some specific benefits that eating seafood presents to your health. Seafood is popular for being a natural source of minerals and vitamins. Vitamin B1, B3, biotin and B-12 are some B-complex vitamins that perform many important functions, such as influencing metabolism, energy production, concentration and skin health. Certain types of fish such as salmon are rich in Vitamin A which boosts the reproductive and immune system’s capabilities and also protects your vision. Another important vitamin found in the fatty skin of tuna, salmon and other types of fishes, is Vitamin D. This vitamin promotes bone growth, helps in absorbing calcium and also boosts the immune system’s efficiency and cell growth. 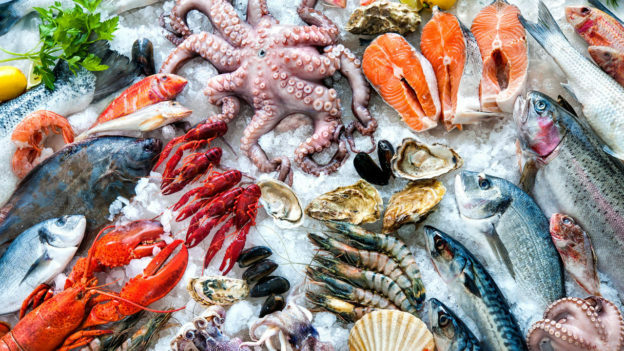 Regularly eating seafood has been proven to ease symptoms of arthritis as omega-3 fatty acids ease tender joints and reduces morning stiffness and other symptoms of rheumatoid arthritis. Omega-3 fatty acids have also been linked to reducing inflammation and pain for patients suffering from any autoimmune disorders, including osteoarthritis, lupus and inflammatory bowel disease. Although a diet rich in omega-3 fatty acids doesn’t appear to slow the progress of any autoimmune disorders, it may ease some of the discomfort. While seafood is healthy enough for containing low saturated fats and high amounts of protein, the greatest health benefit it can provide is through the omega-3 fatty acids, which are known for the benefits they provide to heart health. Omega-3 fatty acids significantly reduce the risk of cardiovascular events such as strokes, arrhythmias and heart attacks. Though omega-3 fatty acids can be acquired through capsules, scientists recommend the consumption of seafood for its intake. Seafood consumption helps in preserving moisture in the skin. The natural glow of your skin is affected more from what you consume than what you apply on it directly. Omega-3 fatty acid present in seafood helps protect the skin against harmful UV rays from the sun. Recent research also suggests that fish oil helps in reducing the frequency of acne. Various studies indicate that consuming fish during pregnancy has positive benefits on the birth weight of the child. This happens because it enhances the growth and development of the fetus. Eating seafood also reduces preterm delivery and is essential for the development of the central nervous system. Eating fish has ample benefits as it’s a good source of omega-3 fatty acids along with many other vitamins, nutrients and minerals. There are many variations of seafood to choose from and while one of the greatest drawbacks of seafood is the “fishy taste”, there are many delicious ways of including it in a meal.